I have twelve swatches, all made by different knitters, left over from the knitting gauge experiment that I wrote about a couple of months ago. Although I gathered the swatches anonymously, I found that I could tell which one was mine, just by looking at the final bind-off stitch. 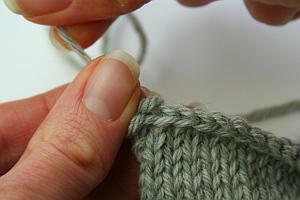 More than half the swatches have an enlarged stitch sticking out just below the final bind-off. It makes the corner look untidy, rather than neat and square as my inner perfectionist would prefer. I've found a simple trick to fix this in my own knitting, so—presuming that I'm not the only knitter with perfectionist tendencies—I thought I'd pass it on. Wobbly edge to neat, square corner. Why is there an enlarged stitch? The problem stitch is bigger because it has excess yarn in it. 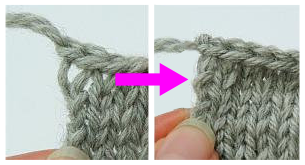 All end-of-row stitches are left with extra yarn after they've been worked (here's why), but this is usually disguised because the stitch is pulled up and in when you start working back along the row above. When binding off you don't work back of course, so the bigger stitch just sits where it is. 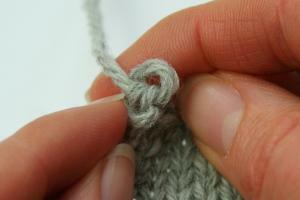 There is an easy way to hide the excess yarn though, by capturing the enlarged stitch within the final bind-off loop. 1. Cut the yarn and pull the end through the final stitch as usual, but stop before closing the loop tight. 2. Push the loop down so it's alongside the bigger stitch on the row below. 3. Keeping the loop in place with one hand, pull on the yarn end until the enlarged stitch on the row below has been trapped within the final loop—just enough to pull it back in line with the side edge. Don't pull tight else it will just look like a big knot. 4. Admire your neat corner. There are other methods to tidy up the final corner. One of them involves pulling the final stitch close and tight into the knitting, while another involves lifting the enlarged stitch onto the needle and knitting it together with the final stitch. Simple: it's the same process whatever the stitch pattern. 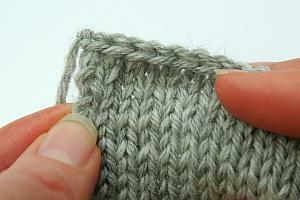 Using the method of picking up the stitch from the row below can be tricky if you're not working in stockinette stitch. 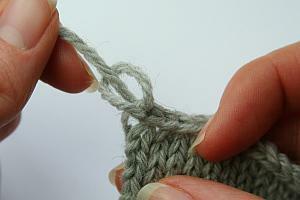 Easy to undo: the final bind-off stitch is not pulled tight, so it's easy to unpick if you need to. Most importantly, it makes a very neat, square corner, which keeps my inner perfectionist happy.